Are you keeping embarrassing videos on your iPad that you do not want anybody to see, and you are looking for some ways to use and shred these video files on your iPad iOS 11 in order not to compromise your self-esteem? No worry, solution you seek exists. It is true that not being shy before a camera is not an offence, given that most people are not shy when they are recording videos of themselves once it remains private in their device. Nevertheless, a time will come when you will feel no need of keeping those videos any more. Hence, you will like to reset your iPad in order to wipe out all such videos from your iPad iOS 11. Nonetheless, you are skeptical that iPad factory reset may not overwrite such files, making it possible for data recovery tools to regain such videos again. The question now is, "how can you securely reset your iPad iOS 11 for the deleted files to be beyond the reach of any data recovery tool?" The following paragraphs will explain the best possible ways of achieving this. Before now, factory reset seems to be the only way through which an iDevice user can regain his or her full storage space back, eliminate sensitive data, and delete embarrassing videos or to wipe out everything on their iPad and start afresh. However, factory reset may not erase all data completely, it's still possible to be recovered by some data recovery tools like iMyFone D-Back. At the present, iMyFone Umate Pro provide a solution which better than factory reset and can be efficient in thoroughly wiping out all the data in your iPad. iMyFone Umate Pro or iMyFone Umate Pro for Mac is an useful tool that can be used to permanently remove all data and content from the your iPhone, iPad and iPod Touch. It has many remarkable features that can ensure your data is deleted safely and keep them impossible to be recovered. Just keep your iPad iOS 11 a brand new device. Step 1: Connect your iPad to your computer and launch the iMyFone Umate Pro on your desktop. Step 2: When your device has successfully connected, click on the tab "Erase All Data". And then click Erase. Step 3: This new window will request that you type in "delete" in a in a box to authenticate your action. Then click "Erase now". It is pertinent to mention that all your files will be permanently wiped out with this procedure and cannot be undone. If you have some important information on iPad iOS 11, you should back them up previously. There are some other good features of iMyFone Umate Pro, you can choose the one mode which suits you best and keep your data private. 1-Click Free Up Space: This feature is very useful, because we can clean up our iPad with Just one click. It can help you remove all junk files, delete temporary files, compress photos losslessly, delete and backup photos, videos and manage unused apps. With easy steps, you can save tons of space. If your iPad iOS 11 was used for a long time, this mode will help you speed up it. Erase Deleted Files: If you want to ensure previously deleted data is unrecoverable then this option will suit you. It can make sure that the files you previously deleted are no longer accessible or recoverable even with the iOS 11 data recovery software. This applies to the cases that you have manually deleted the apps and items on the device, however, you have no means to find the previously deleted files, which is recoverable with certain programs. 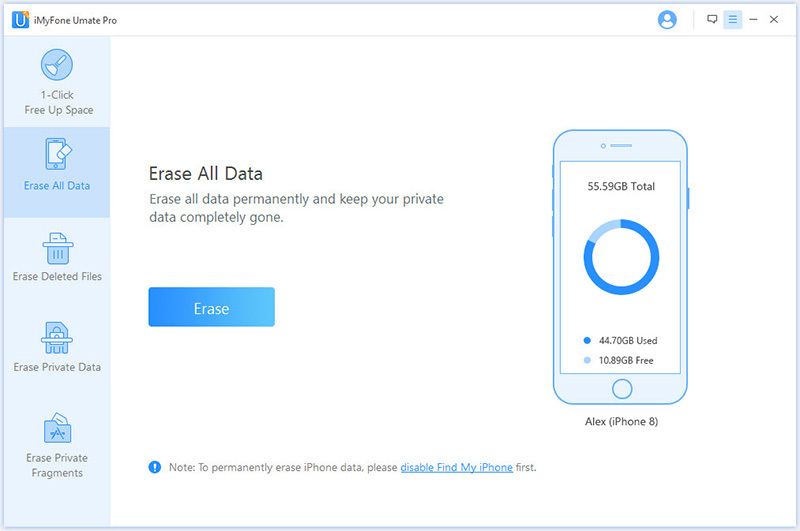 Erase Private Data: iMyFone Umate Pro will delete all private information completely and permanently, so that you can rest assured about the privacy on your iPhone. It can make sure the private data will be rendered unrecoverable, keep your personal information safe. 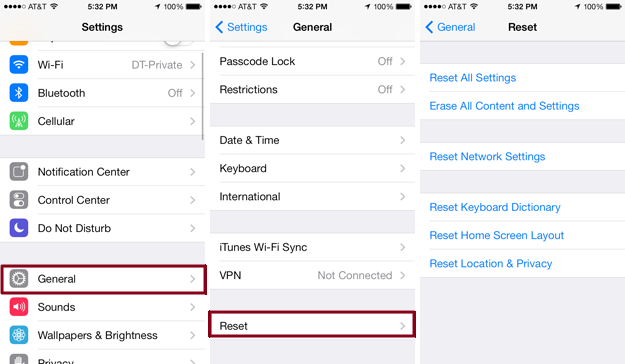 Factory reset can help us wipe all data on iPhone or iPad. Maybe you think factory reset is saf. However, in fact factory reset cannot remove the data on our iPhone and iPad completely. It also can be recovered with some iOS 11 data recovery tools. 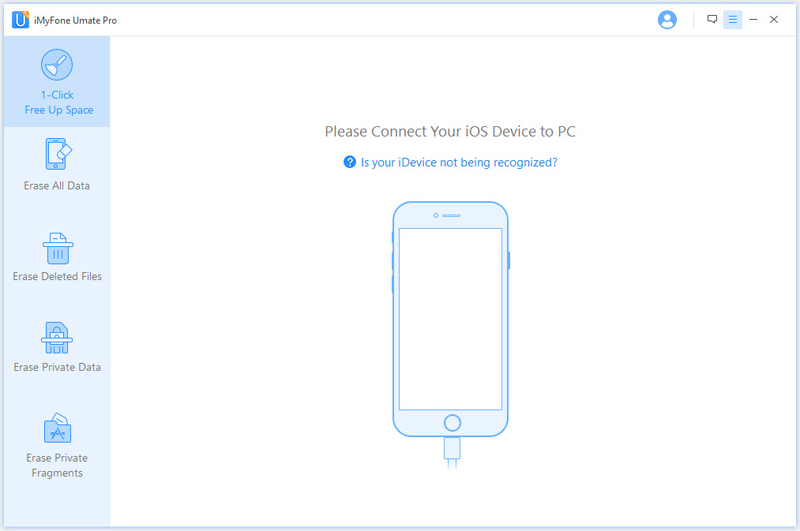 Wiping you iOS device is easy, the only thing you’re going to need is your device passcode, Apple ID and Apple Password. Here is how to reset your iPad iOS 11 if you you've got it. An Erase iPhone/iPad warning box will now pop up. Click "Erase" and enter the device’s passcode and Apple ID info when prompted. 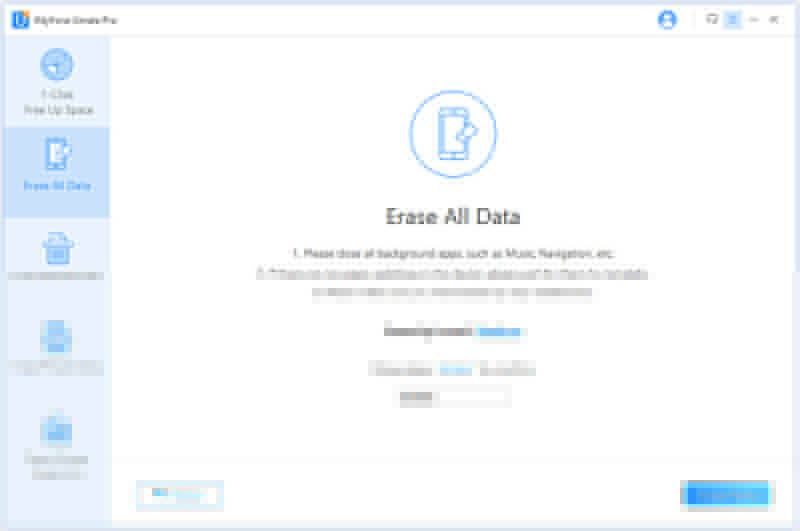 The iPad reset tool - iMyFone Umate Pro can help to 100% erase your iPad iOS 11 private data selectively, it can discover previously deleted files and permanently efface them for good. It gives you the privilege to keep your data unrecoverable by any tool. It can erase all forms of files such as contacts, messages, voice notes, calendar settings, call histories, mails, Safari bookmarks, caches and history, and residual files from applications.